ArisFlow is a dataflow management system designed for managing automated company and production processes. The accompanying process-flow, and its underlying relations between applications and data files are clearly presented in a flowchart. 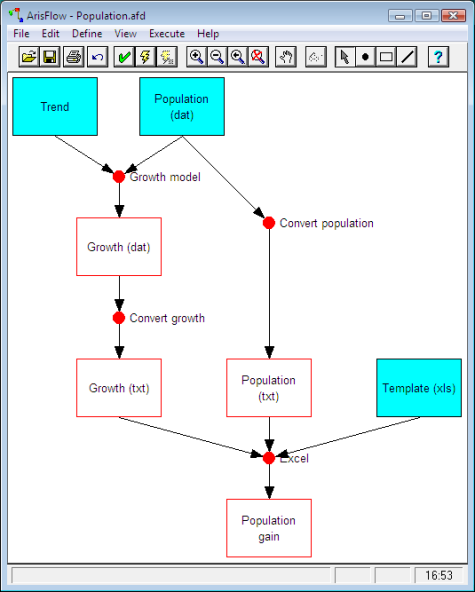 This tool is very usefull for GIS-projects and modelling programs. ArisFlow can execute and control a complete process-flow, or separate parts of it. It also supports working with an unlimited number and diversity of applications and file-formats. ArisFlow helps in many situations, be it ad hoc data analysis, or building of up-to-date systems, like decision support systems. One of the most important characteristics of ArisFlow is the ability to detect changes in data or applications, and subsequently execute only those applications which are needed to recalculate intermediate and final results. An advanced set of status-checking options simplifies checking which parts of a process-flow need to be recalculated. ArisFlow uses definitions which describe how to control applications, how to browse for files, or how to view files. This way, the use of predefined process types and data types (defined by a user or by ARIS) is facilitated. ArisFlow is built using platform-independent libraries. As a result, ArisFlow runs on a variety of platforms, such as Windows, OS/2 and UNIX.